It feels good to be back after a long gap, with some devotional information. I once again take pleasure in sharing the Puja details with my blogger friends and my relatives who celebrate the nine day festival Navarathiri. This year Navarathiri pujai/Golu starts from 13th October. October 12th being Mahalaya Amavasya Kalasa-sthapana or arranging the dolls can be done on Monday (12th Oct). Much awaited continuous nine days pujai beginning from Prathamai thithi till Navami ,is only few days away.Let us all Pray Tridevi for peace and well being of all. I am posting the below link to view the nine day chart in a spread sheet. 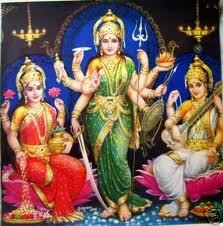 I wish all the readers a very Happy Navarathiri and Dassera. I am adding the kolu picture today after performing pujai on day 1 of Navarathiri. Hi Hema thanks for navarathiri updates.It's bleesing for pooja lovers.